The 254 King’s-Edgehill School Cadet Corps was well represented at the National Cenotaph in Ottawa during Remembrance Day 2017. The Cadets were invited, for the third time, to participate in Operation Veteran, a programme started by Dr. Paul Kavanagh in co-operation with the National War Museum. Operation Veteran began when Dr. Kavanagh noticed one day that our veterans had to pay for a meal in the cafeteria at the War Museum which commemorates their sacrifice. Dr. Kavanagh started Operation Veteran to raise money for a meal programme and to educate young people about our history with regards to global conflicts. Our School raised $900 to help his programme which gives 100% of all money raised directly to veterans’ meals. 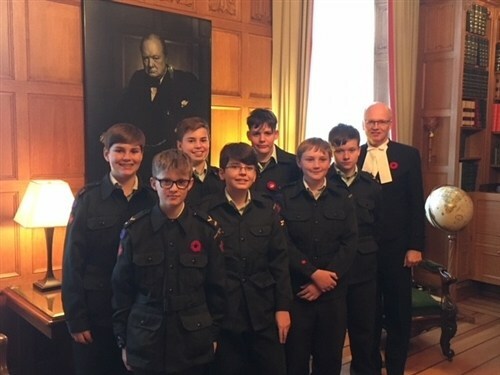 This created an opportunity for twelve cadets to visit Parliament, The National Art Museum, an OHL hockey game, the War Museum, the Royal Canadian Mint, Notre Dame Basilica, the Supreme Court, and present to hundreds of people at the Chateau Laurier. Quynn Rusaw, William Ahern and Thomas Boily helped me present the story of the Halifax Explosion -- the day, 100 years ago, that the violence of war came home to Nova Scotia. Dr. Kavanagh knew we would represent the province and the topic with knowledge and respect. The cadets did not disappoint and showed no nervousness even though the Minister of Defense, Harjit Sajjan, was in attendance at the event and had presented just before our cadets. We also had the opportunity to visit the office of the Speaker of the House of Commons, Mr. Geoff Regan. 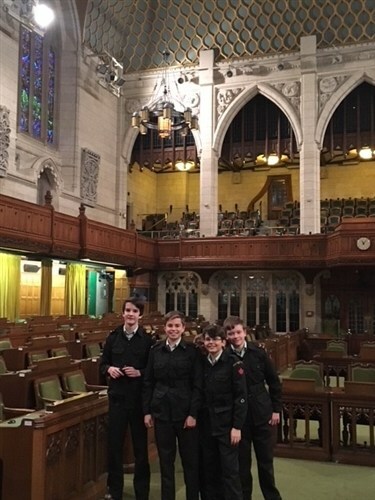 He regaled us with stories and took us to the floor of the commons, with everyone trying out his chair, and a few students even tried out the view from Mr. Trudeau’s desk. It was a memory-making trip for all our participants. Silas Fillmore, Alden Mulherin, Carter Short, Max Escaravage, Jakob Rusaw, Ties Bouwman, Matvey Semenenko, Aden O’Callaghan and Luis Ganem represented our Corps, our School and their families very well. Next year, the focus will be on Women’s Contributions during Wartime. Our goal at KES will be to send a contingent of female cadets to Ottawa in 2018. The cadets thank Captain Hynes and Ms. Schafer for their support, all the students and faculty who contributed to our Dress Down fundraiser and Dr. Brad Rusaw for his help and contributions to the weekend of learning and friendship. Leadership. Precision. Respect for Tradition. 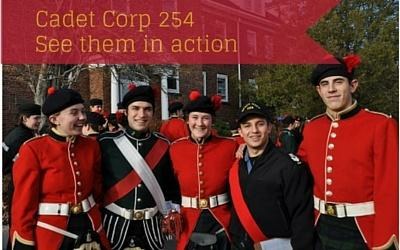 That's why every King's-Edgehill student becomes a proud member of our Cadet Corps. Download the Cadet Corps PhotoJournal for pictures and information about this exciting opportunity.